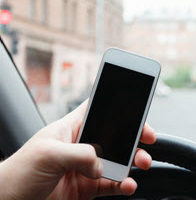 Should Cellphone Companies Be Held Liable for Distracted Driving Accidents? Cellphones pervade every aspect of our culture today, and everyone from high power CEOs to high school seniors use them hourly to communicate, search for answers, and entertain themselves in general. It is no wonder, then, that cellphones are a leading cause of traffic accidents in today’s society, and continue to pose a greater and greater threat to driver safety each and every day. According to the National Highway Traffic and Safety Administration, distracted drivers cause 20 percent of all traffic accidents. In fact, distracted driving accidents accounted for 3,179 deaths and 431,000 injuries in 2014 alone. While other factors certainly play a role in distracted driving, such as eating, listening to loud music, and distracting passengers, cellphone use is certainly a major culprit. The NHTSA estimates that cellphone use is responsible for 385 fatal crashes in 2014. At Spencer Morgan Law, our Miami car accident lawyers have to wonder: are cell phone companies doing enough to prevent distracted driving incidents? Apple patented a safety fix a few years back that could detect when a device was in an automobile that was “in motion” and that would deploy a “lock out” mode to prevent drivers from handling their devices while behind the wheel. However, none of their current iPhone versions have that feature, a fact that many accident victims have recently called to attention. Ashley Kubiak is just one example of how Apple’s lock out mode could save lives, and how their hesitancy to implement the feature has resulted in lost lives. In 2016, Kubiak was distracted by her iPhone when she crashed into another vehicle in Texas. She killed the driver and passenger and paralyzed a child. Kubiak was convicted of negligent homicide and sentenced to five years on probation. In addition to suing Kubiak, the victims’ family members pressed charges against Apple. “Plaintiffs are saying to manufacturers: if your product unnecessarily diverts the driver’s attention away from the road in the moment before a collision, you may be on the hook,” Stanford law professor, Nora Freeman Engstrom, said. If their case prevails, it could have far-reaching implications for manufacturers and businesses everywhere, including navigation systems, car radios, and even fast food restaurants. While it is true that Apple patented the lock out feature, there may not necessarily be grounds for liability. The technology does have the ability to detect whether a device is in motion, but as of yet, there is no way for that technology to detect whether or not the driver is the person using the technology that is in motion. For that reason, Apple has not included the lock out mode on its devices, which may be just enough reason to free them from liability. With that being said, Apple moved to dismiss the case on the grounds that drivers should take personal responsibility for their own actions, and that any number of objects could pose a distraction, including food, navigation devices, or even passengers. Case in point: there were 25 times more fatalities caused by alcohol impaired drivers than those caused by cellphones. And though car manufacturers have the ability to install ignition interlock devices on their vehicles, they are not legally obligated to do so. If you or a loved one was injured in a car accident caused by a distracted driver, and if you believe that a cellphone was to blame, reach out to the Miami car accident lawyers at Spencer Morgan Law to learn more about your legal options. Though it may be difficult to sue a cellphone company for damages, it is not impossible. For a free case evaluation, contact our team at 305-423-3800 today.